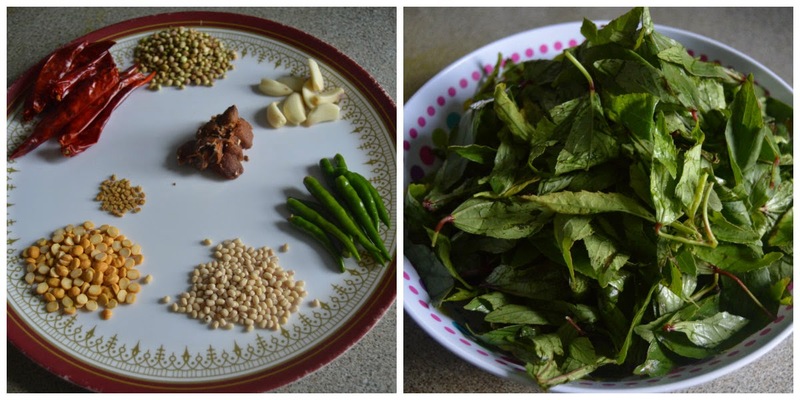 Pavi's Platter: Gongura Pachadi / Red Sorrel Leaves Chutney ! Gongura Pachadi, the quintessential recipe in Telugu Cuisine is one of my favourite pachadis/pickles for its tangy and sour taste. It is so famous in the state of Andhra Pradesh that it makes a sure presence in every restaurant , eateries and food joints all over the state. It is also rich in iron, vitamins and folic acid. It can be prepared as a pachadi like this or even pickled for longer shelf life. Heat a pan and add some oil. Once hot add the dals and start frying them. Once they turn slughtly golden add the corainder seeds and fry everything till they are roasted well. Throw in the red chillis and green chillis and garlic and saute them well. Once they are roasted well, transfer them to a plate and keep aside. Now in tne same pan add the sorrel leaves and fry them. The color will change to a greenish brown and the leaves start to shrink. Once the leaves are well fried and shrunk it will look like something in the second thumbnail. Let it cool. Then take the dals and chillis that were roasted in a mixer, add salt and tamarind. We love tangy taste so added some extra tamarind, you can skip that if you feel the tanginess of the leaves are enough. Grind them to a coarse powder and then add the sorrel leaves and grind them to a coarse paste adding little water. Heat oil in a pan, add mustard seeds and urad dal. Once the dal turns brown add the jeera and dried red chillis. Add hing and crushed garlic and turn off stove. Add this tadka to the ground pachadi or add the pachadi to the pan and mix well.